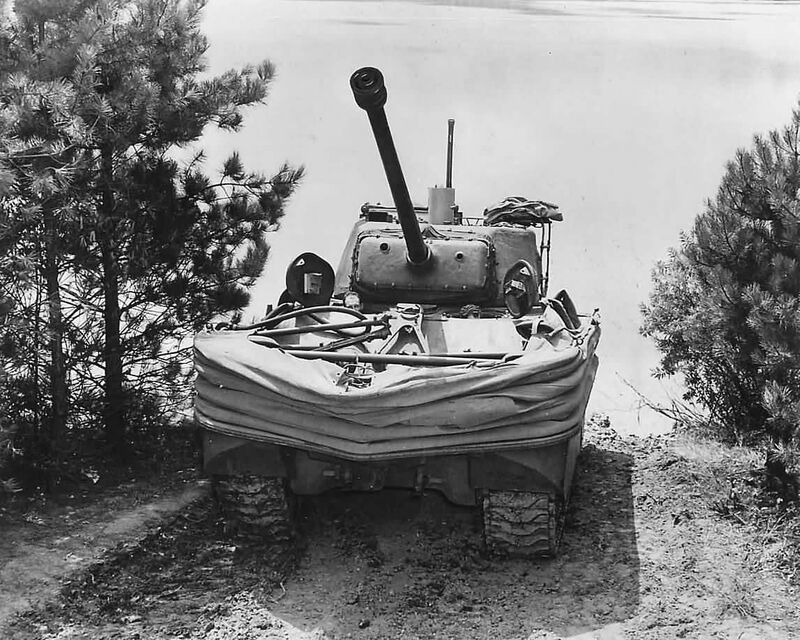 After two failed attempts to push off the beach in this sector the Canadian commander reluctantly decided to commit the third platoon of Company A and called up a couple of Shermans from the Fort Garry Horse as support. If they couldn’t push through then an alternative exit would need to be found. The German defenders had proven exceptionally capable, although they had the terrain advantage. The original defending platoon was still in place after repulsing the first two attacks of the morning, having sustained only a single casualty. Now in the early afternoon the defenders would have to form their line, but this time the rumble of distant tanks could be heard from amongst the dunes. The Shermans came as free support and Peter rolled a 4, opting for a 2″ Mortar team and Pre Game Barrage. The mortars had proven very useful in previous games for putting down a smoke screen and using the barrage to disrupt the German defenders would hopefully help the Canadians make some headway. I decided to add another Panzerschreck to my force and I knew the Canadian armour was on its way. I think both Peter and I got what we’d hoped for from the Patrol Phase. The scouts from both sides had experience of this terrain… I wanted to ensure I could use the wheat field on the bottom right and the left-hand house as points from which I could mount a defence. Peter also positioned his patrol well. He has options on the right and near the beach exits. And here are the jump-off points. The Canadian one behind the right-hand dune is familiar territory, although the one on the top-left is a departure from previous attempts. The German jump-off points are in very similar positions. Here are how things stand after ten, or so, phases. I had a run of 4-5 phases in a row that allowed me to build up some Chain of Command pips (shown on the die in the bottom-left). Peter took an early opportunity to bring on both Shermans, to which I responded by bringing on my Panzerschreck. Although the barrage disrupted my plans the flow of phases mitigated that somewhat. The Panzerschreck hit the Sherman near the middle exit, causing a small amount of shock and damaging the gun sight. Peter’s mortar began to lay down some smoke. Peter eventually rolled a double turn, but also ended the turn, and his smoke drifted away. His damaged Sherman trundled into the dunes. I deployed a section into the middle house, while Peter began to establish some strength on the right-hand side. His damaged Sherman intended to dash down the eastern side of the middle house, but the driver fumbled with the gearbox (while I had ominously built up a Chain of Command dice). I used that dice to pop a Panzerschreck team ambush which resulted in a solid hit on the flank of the Sherman resulting in the allied tank exploding spectacularly. Meanwhile I shifted my section in the field right slightly to try to block off an dash the Canadians might make. The Canadian’s mortars kicked into action and put an impressive screen down in front of the defenders. His other Sherman began to rumble forward to support his infantry with some MG fire. I doubled down with another section in the field and began to push the Panzerschreck team towards the tree across the road in an attempt to draw a bead on the Sherman. Meanwhile I began to put some fire into the advancing infantry. Peter saw the exposed Panzerschreck team and brought a section forward near his central jump-off point. The following fire killed a man and from the Panzerschreck team and the nearby MG team. My senior leader ordered another soldier to join the Panzerschreck team and began tidying up some shock on the nearby sections. The rightmost section continued pouring fire into the forward Canadians. In return they had to sustain fire from the Sherman. The forward Canadians broke and fell back, dropping their Force Morale. Their Sherman moved forward and coupled with Peter’s Chain of Command dice the possibility of an interrupt to get the tank to burst through my line was starting to look like a distinct possibility. The excellent mortar smoke screen was keeping the advance concealed. Peter managed to gun down the Panzerscheck team, meaning I’d have to rely on the other team to take care of the advancing tank. The dice rolls went well for me and I managed to get a Chain of Command dice of my own. However, it was too late. I ambushed the Panzerscheck team into the smoke, but Peter interrupted just in time to get the push the tank through my line. My German defensive line had been broken. Time to regroup and shift the defence further inland. The Canadians had suffered significant losses in the previous two attempts to clear the beach, but this time around they fared better. The lost 7 figures during the game, which works out at 3 dead and 2 missing the next game from 3rd Platoon. As a recap, 1st Platoon has lost 5 men, one of which was an NCO, so they have an untested replacement section leader; 2nd Platoon have lost 8 dead, including an NCO and the Platoon Lieutenant. As it stands 3rd Platoon is the most intact unit in Company A. With their victory the Canadian’s CO’s opinion increased by +1 to -1, but his Men’s opinion slid a further -1 to -7 due to their losses. This fight resulted in the first significant losses for the German 1st Platoon. 2 men died and a further 2 will miss the next battle. Their CO’s opinion dropped to +1, but the light losses saw the Men’s opinion increase to +4. A Panzerschreck is a formidable weapon for a Sherman to face. It’s ability to penetrate even the front armour is significant. Not generating a second Chain of Command dice until late in the game meant I couldn’t clear the smoke screen. This caused me to get little reckless with my first Panzerschreck team and allowed Peter’s second Sherman to approach without taking any fire. Lesson – Chain of Command dice are important when there’s smoke around! I’m looking forward to fighting in different terrain. This was a good defensive position for the Germans as the Canadians had to cross a lot of open terrain. Next time the terrain offers good cover for both forces.